Ray Quinney and Nebeker, a prestigious law firm headquartered in Salt Lake City, wanted to present their "A" and "B" clients with a holiday gift to show appreciation for their business. The gift needed to be perceived as high in value and to reflect well on the law firm's earned image. 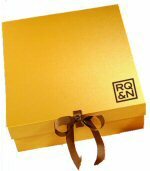 Proforma suggested two separate gift items for RQ&N's clients. Both featured Godiva, a renowned chocolate company. The gift for their "A" clients was a Godiva gift set that included milk chocolate hot coco, traditional European biscuits topped with milk chocolate and a gold double walled stainless steel thermos wrapped in rich, top grain leather. The set was packaged in an elegant gold collector's box to complete the luxurious look. The firm's branding was debossed on the leather wrap around the thermos and placed on the gift box as well. The "B" clients were presented with theCustom marketing solutions. Custom commercial printing. Holiday event marketing. Business gift giving. Case Study. thermos in appreciation of their business. RQ&N was impressed with the gift sets that Proforma developed; the clients appreciated the gesture and enjoyed the gift. Proforma proved to be a total solutions provider. Create a valued holiday gift for your employees or customers. Contact us today.